You would never know it by looking at me, but I’m actually pretty old. Not that I’m going to tell you exactly how old but we all know from my first blog post that I have a married daughter. I also have two sons, Zack and Tyler. Not only am I old enough (somehow) to have a married daughter but the older of my two sons, Zack, graduated from High School in the Spring of 2012. As American tradition holds, we promised Zack a present for finishing the rigorous four years of High School, and it came down to two choices: A laptop, or a trip to Cedar Point amusement park. Despite (or perhaps because of?) the obvious utility of a laptop, Zack chose the king of rollercoasters: Cedar Point. On an early morning in June of 2012 we packed up and left Omaha to make the 12+ hour drive to Sandusky, OH. Cedar Point is home to more than a dozen huge roller coaster of every kind imaginable. Wooden, steel, inverted, sitting, standing, and negative drop. We rode them all without hesitation. Until it came time to ride the Top Thrill Dragster. If you haven’t seen it, the Top Thrill Dragster is an absolutely monstrous roller coaster that starts at ground level and shoots you over 120 miles-per-hour and more than 400 feet straight up the track. When you reach the top of the curve you slowly, and I mean slowly, roll to the other side where you are met with another 400 foot twisting free-fall back to the ground where the tracks bring you back safely to where you started. 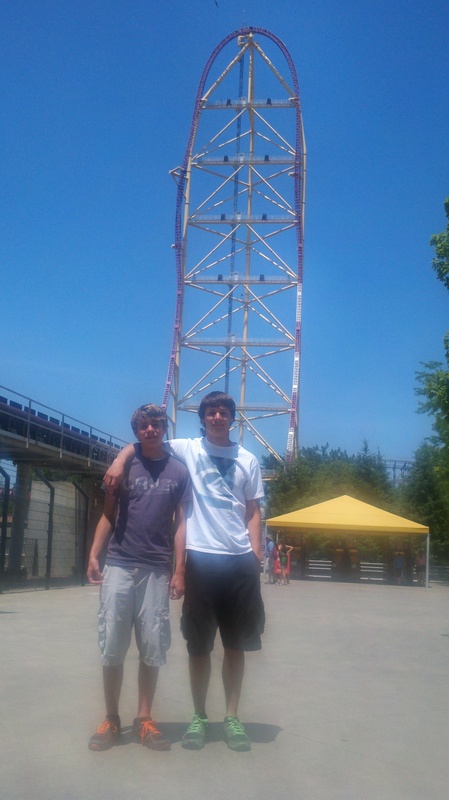 I had never before been intimidated by an amusement park rollercoaster until I walked to the entry of the Top Thrill Dragster with Zack and Tyler. In fact, I was so nervous I made the boys stop to take the picture you see here in front of the tracks just to kill some time in an attempt to delay my inevitable ride 40 stories into the sky. But, the picture only lasted a few seconds and I was forced to put my fears behind me, get on the ride, and enjoy what turned out to the best.ride.ever! The only thing to do at that point was to get back in line and ride over and over and over again. So we did. Me: Have you been on this ride before? Him: No. I’ve actually never been on anything before. Me: You mean this ride? Him: No, I mean anything. I have never been on any rollercoaster before. In fact, I have never been on a ride of any kind before. This is my first trip to an amusement park. Me: You know this is like the highest and fastest ride in the world, right? Me: Yep, it’s true. It’s pretty quick though so you will be OK.
Me: Just look for the dragster lights to count down to green. In fact, there they g………..o! Him: Oh my gosh! Holy cow! Ahhhhhhhhh! Him: Oh! Oh! Oh! OH! OH! OH NO!!!! With that my buddy ran off and our brief relationship came to an end. I have since pondered the differences in our risk taking in relation to riding the Top Thrill Dragster. I was cautious and took my time in deliberating how I was going to get on the ride and survive to live another day. My riding partner simply picked a line and got in, completely oblivious to the experience he was about to have. Although it turned out fine for him I often wonder how things might have been different had he been completely traumatized by the Top Thrill Dragster. In relating this experience to investing I am happy to say I work for an asset manager who approaches fear and risk with caution, and optimism, when making investment decisions for our clients. The financial markets can be a risky and scary place and we have all seen what happens when a financial services company acts in its own best interest and takes unnecessary risks – only their investors getting harmed. In the end I am confident to tell you that at CLS we have the temperament and morals to help our clients face their financial fears and achieve their financial goals without taking unreasonable risks on their behalf.